These are bits of code taken from working applications that do something useful. Although they worked in the original applications, they could be slightly modified and placed here without any specific testing and out of context - use it at your own risk. It's not a snippet but a small Turbo C++ project, but I want to have it at hand. Callback class/template is taken from codeguru. recreation after shell restart (WM_TASKBARCREATE). It uses some Borland-specific code (TImageList, TTimer, TNotifyEvent, FreeNotification), so it will be unusable with non-VCL environments. // not sended by Vista! // timeout = 2s only! Note that RC4 uses XOR and encryption and decryption is exactly the same operation (application would encrypt file if it is currently unencrypted and decrypt if it is encrypted and proper password is supplied). This is plain, unmodified variant of RC4 and it should not be considered secure (similar to WEP). ... or why not to use non-OwnerData TListView for large data collections: ownerdata_test.7z. Nice looking hexagonal grid context menu with mouse over effect. Made for miniscope v3 application. Used image is black and white grid with emboss effect added using Paint.NET. Turn off transparency if you're planning to use this with Windows 98 or link setLayeredWindowAttributes dynamically. 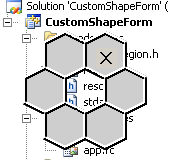 Used same hexagonal toolbar bitmap as in miniscope v4 and VCL snippet.